While perusing my favorite used game store a few weeks ago, I came across a great gem that holds fiscal value as well as sentimental value. It may not be as exciting as coming across a Nintendo World Championships cartridge, but it is still one worth writing about. The game in question is Digimon World 2. Online, you would be lucky to get it for $50-$60. I picked it up for a mere $8. I was ecstatic. For those of you unfamiliar with Digimon as a whole, it started in the form of a keychain digital pet, like Tamagotchi (In fact, they were Bandai’s spin-off of Tamagotchi). The franchise got wildly popular in Japan and mildly popular in America. Most of the games produced at the time, like many Bandai products, maintain a great collector’s value. Digimon World 2 is one of the more valuable games for the PS1. So, what is the game all about? 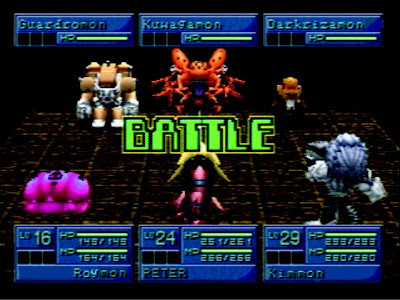 Digimon World 2 took a different route from it’s predecessor, which had the player raise a single Digimon much the same way as he or she would on the keychain. The game did take place in a 3D world and had a storyline, but was more focused on the raising of your digital pet. In the second game, the player is a young boy who is just stepping into the role of a Guard. You choose one of three factions to join, which determines your starting partner. From here, the game becomes a dungeon crawling, turn based RPG. You can recruit other Digimon and have teams of three at a time to help you in the dungeons. At first, your new recruits can only reach a low max level (e.g. 16). You must use DNA digivolution to raise that level cap. You are also rewarded Digivolution Points, which can affect what your Digimon will digivolve into. The digivolution process is the most difficult, and some times frustrating part of the game, but if done correctly, is quite rewarding. It is possible to go all the way to Mega form for some digimon (The fourth and final form). Another challenge in the game is the dungeon crawl itself. 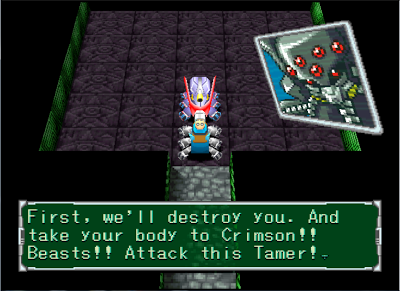 The protagonist, Akira, is charged with entering Domains (the dungeons) and defeating evil Digimon. To do this, you must (obviously) reach the end of the dungeon. This is not as easy as it sounds, because your Digi-Beetle, the tank you drive around the Domains in, only has a certain amount of energy that gets depleted with every step you take. This adds limitations to exploration early on and until you upgrade your engine, could result in playing a Domain over again. These frustrations add to the addictiveness of the game. It adds challenge that many of today’s games simply lack. If you happen across this game for a decent price, I would recommend picking it up and giving Digimon a chance. Even if you decide you do not like the game, you could make a decent profit off of this rare work. I found a copy of the first Digimon World game, also at a game store for a very low $5. The only catch was that the manual was missing, but $5 more spent on Ebay for a manual resulted in getting a complete copy of Digimon World for only $10. Not bad lol. Great article. There's no better feeling than getting something rare for a great price. My best find to date is getting a very nice complete copy of Intelligent Qube at the Goodwill for $2.97, but today at a flea market I found something that has the potential to be better. Is anyone familiar with the PC version of Powerslave? I got a very nice complete copy for $4 and to my surprise there's very little information on it. Does anyone know if it's valuable and why there's no sales record for a complete copy? I found my copy at a church thrift store for 50 cents.